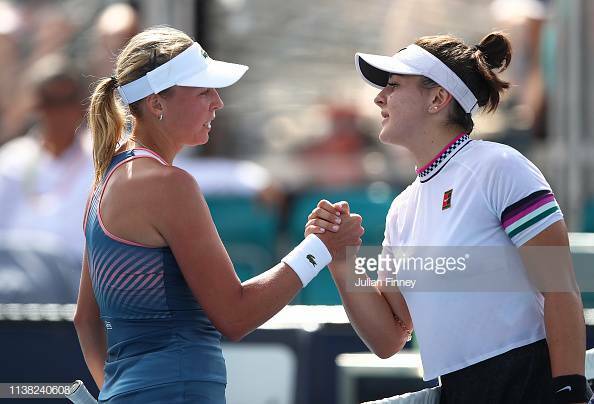 Andreescu and Kontaveit shake hands at the net. The Indian Wells champions opts out of the first clay tournament in Charleston to rest up for Canada's upcoming Fed Cup tie. BNP Paribas Open champion Bianca Andreescu has pulled out of the Volvo Car Open. The Canadian sensation retired from her fourth round match at the Miami Open against Annet Kontaveit. The 18-year-old was down 2-6, 0-2 down before calling it against the Estonian. "I have played so many matches. I guess this is just a way of my body telling me that it's had enough. It's disappointing, but it's part of the sport," said Andreescu after the match. Andreescu's next event will be Canada's Fed Cup World Group Playoff tie against the Czech Republic who are the defending champions. That tie will take place on April 20-21. Despite the loss of the Canadian from Charleston, the field is still excellent with 14 top-30 players including former champions Kiki Bertens, Sloane Stephens, and Caroline Wozniacki. Other notable names include Aryna Sabalenka, Ashleigh Barty, Anastasija Sevastova, Elise Mertens, Julia Goerges, Madison Keys, and Belinda Bencic inside the top-20.